“My mother had me when she was only 16 years old, and when I was an infant I was adopted by her parents. I grew up very confused as to why I was rejected by my mom. I pushed down all the negative emotions I was feeling and at age eleven. I could feel a cloud of depression hovering over me. I did not know how to cope with these emotions, so I began self-harming at age twelve, which turned out to be a difficult two-year battle. When I turned thirteen, I began dabbling with prescription drugs until I turned fourteen and discovered Methamphetamines. I withdrew from life, and actually attempted suicide more than once. My mom found out about Mercy Ministries when she was desperately searching the internet for some place that could help me. She found the program and encouraged me to apply. Since I have been at Mercy, I have been able to see God’s grace on my life. He has helped me learn healthy ways to cope with everyday problems, how to confront people and how to ask for help. He has taken the mess that I thought was impossible to fix, and shaped my life into an amazing story that I plan on sharing with people who are desperate, just like I once was. “When I was five I was sexually abused by my cousin who was 8 years older at the time. I developed a deep root of shame and believed that I was an object to be used. At the age of twelve, my dad moved out and it led to thoughts of failure and unworthiness. The lack of relationship with him made me feel completely broken inside. I fell into a deep depression and hated my body, my personality, and my lack of faith in the Lord. I began to self-harm in the eighth grade and it became a fast addiction. I became involved with guys, seeking the attention that I had lacked from my father. I desperately wanted these guys to tell me I had value to them. I let go of all that I stood for, lying and living a double life. During the next seven years, I struggled with thoughts of suicide and attempted suicide several times. Finally in April of ’07, I overdosed and it was then that I knew I needed help. I had reached the end of myself and decided to pursue the life God had for me. A high school classmate, who later became my best friend, was applying for Mercy Ministries and told me about the program. In the book, God’s Pursuit of Man, by A.W. Tozer, he sums up perfectly what Mercy has done for me. “To whom the word comes in power know this deliverance, this inward migration of the soul from slavery to freedom, this release from moral position, a REAL crossing over, and they stand consciously on another soil under another sky and breathe another air. Their life motives are changed and their inward drives made new.” The enemy could never stop me from knowing my Father, whom I begged to know during the seemingly endless nights of tears and hopelessness. “I came to Mercy Ministries with a severe eating disorder, self-hatred, and a very skewed perception of God. I had tried other treatment centers but got the same result every time—behavior modification. After I would leave, I would go right back into the same behaviors because I still had the same mindset that I had when I walked through the doors. The only thing I got out of treatment was more knowledge of the disorder and an “it’s not my fault” mentality. I believed I would always have an eating disorder and I would just have to learn to live with it. I found out about Mercy about a year before I came from a friend who was also struggling with an eating disorder. A year later, when I really needed somewhere to go, my mom reminded me of Mercy. This time I was ready to apply. Since I have been here, God has completely transformed my life. I have experienced God’s love, and for the first time can love myself. I don’t have to try to stop my destructive behaviors on my own, but because of God’s love, I naturally don’t want to do them. He has restored my relationship with my family and has brought me back to wholeness. I no longer desire thinness and outward beauty, but I desire what God desires, which is to love Him and His people. My plans after Mercy are to do an internship at the St. Louis Dream Center. I honestly don’t know exactly what I want to do with my life after that, but I will do whatever God wants me to do. I do know that I want to help other girls who struggle with eating disorders and hopefully one day work at Mercy Ministries so I can give back what God has given to me. “I came to Mercy Ministries struggling with major depression, border line personality disorder, cutting, and a secret eating disorder. I struggled with this eating disorder on and off for three years. I was born with mild Cerebral Palsy, and from the time I was young, I felt like I was a misfit in my own family. I became very deceptive and manipulative. I was in and out of many hospitals, and on many different medications, though none of them seemed to help. I had many unsuccessful suicide attempts. I found out about Mercy while looking for a treatment center on the internet. I first applied to the program three years ago, but did not complete the application process. I moved on with what I thought was life, still struggling with all of the issues mentioned. One day I randomly stepped into a bookstore and found the book, Mercy Moves Mountains. This was so God, because it was a book which that particular book store didn’t carry on a regular basis. I thank God that it was there at the time because it caused me to re-apply to the program. While I have been at Mercy, God has shown me that I am not a mistake and that I am fearfully and wonderfully made. God has also shown me that I am a child of God, bought for a very expensive price. He has shown who I am in Him and that I am beautiful inside and out. He is my refuge when I’m feeling overwhelmed with my emotions. 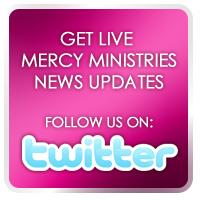 “Before coming to Mercy Ministries, I struggled with severe depression. I was adopted when I was five, and because of neglect at an early age, I had a hard time trusting my new parents. I pulled away from them and thought that they would abandon me just like everyone else in my past had. I was emotionally abused and had a hard time feeling accepted and loved. My parents were very controlling, and I wasn’t allowed to do many things that a normal teenager should have the opportunity to experience. I became very rebellious. I often stayed in my room all day because I felt like I wasn’t worth paying attention to, and food became my comfort. I was labeled as having Reactive Attachment Disorder. It came to a point where I just wanted out of the whole situation. My parents learned about Mercy Ministries from a couple at our church whose daughter had gone through the program. My parents told me about it, and I started the application process right away. Since being at Mercy, I have experienced God’s unconditional love. When I messed up, the staff didn’t give up on me and helped me through everything. I have never experienced that before. I’ve learned to turn to God, instead of food for comfort, joy, and acceptance. I now know that no matter what my parents do or think, I have great worth, and I have a Father who will never leave or give up on me. I learned about appropriate food portion sizes, and how to enjoy exercising and hanging out with girlfriends. I’ve forgiven the people who hurt me, and no longer dwell on the past. I’ve worked through some things with my family, and I have hope now. Congratulations to all of the Girls! We are so proud of you!